Agility Spine and Sports Physical therapy is highly recognized as one of the go-to stops for physical recovery in the greater Tucson area. One of our biggest strengths is our ability to meet the needs of patients who deal with a variety of ailments and physical pain. Physical pain could stem from a work injury, sports injury or simply a pain that has compounded over the years and is in need of the proper treatment in order to heal properly. Our goal is to provide the best physical therapy services in Tucson, so our patients can go home and live their normal lives pain free. Many of our patients are former athletes who have obtained injuries over the time of their sporting careers and have failed at finding adequate treatment options that serve all facets of the recovery process. 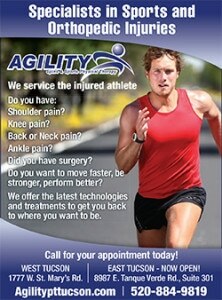 What do you get from Agility Physical therapy services in Tucson? Once you have scheduled your consultation with one of our physical therapist you will be aided in all of the necessary knowledge of your injury and how we can help. We offer treatment options and set realistic goals that focus primarily on the recovery of our patients. Our goal is to get you back to your normal pain free life without the loom of reoccurring pain as quickly as possible. Our physical therapists are professionally trained to assist you in strategizing the treatment methods that suit your particular injury. Agility works hand in hand with the patient to deliver treatment options that not only strengthen the weak area but to teach you exercises and skills that patients can utilize on their own to stay in peak form. Looking to find the best physical therapy services in Tucson, look no further than Agility Spine and Sports for all of your needs. We provide top of the line patient care from day one and look forward to helping you get back to pain free life you remember. If you want to know more feel free to call us today and set up a consultation with one of our therapist and let us help you on the path to recovery.